If this is a recovery, why is the patient still on the critical list? Time ticks on: We are told the recovery is well under way but have yet to enjoy any of its benefits. Why? Official figures say the British economy has grown by 0.8 per cent in the last three months. The Conservatives are rejoicing over this feeble effort, while saying there’s more to be done; an amazing attempt to travel in two directions at once, that should fool nobody. It seems the recovery is becoming more balanced, with services, manufacturing and construction all registering expansion. And it is predicted that the economy will recover to the same level as its pre-recession peak by the middle of this year. But who, exactly, is this recovery helping? I’m actually worse-off than this time last year. How is it for you? My income has not increased appreciably since 2007. Meanwhile the rent has gone up and the costs of energy and groceries have skyrocketed. The Labour Party has calculated that average earners will be more than £2,000 a year worse-off than they were in 2010, by the time of the general election next year. What conclusions may we draw from this? Well, we know that the recession did not harm the richest in society at all. Their profits increased massively, even while the economy was flatlining, because that’s what happens in times of hardship; the poorer, more precarious firms go out of business while the larger ‘fat cats’ mop up the trade those competitors would have had. If the economy is recovering to its pre-crash level, and average people are worse-off by around eight per cent of their pre-crash earnings (if you say the average wage was around £25K per year), then somebody must have benefited – and the most likely candidates are the same rich businesspeople who were never touched by the recession or austerity in the first place. Also the bankers who caused the mess in the first place. So we have a situation in which the average earner – who, don’t forget, makes the entire economy work (we spend a higher proportion of our earnings than anyone else – by necessity, and this pushes money through the system and creates economic growth; the very rich hoard their massive wealth, usually in offshore banks) facing increasingly hard times, while the richest enjoy all the benefits. … all engineered by a government of millionaires who have financial interests in big business and whose political party is backed mainly by bankers. This has all the hallmarks of a conspiracy. If the economy is in recovery, why does it still feel like recession? Path to prosperity? 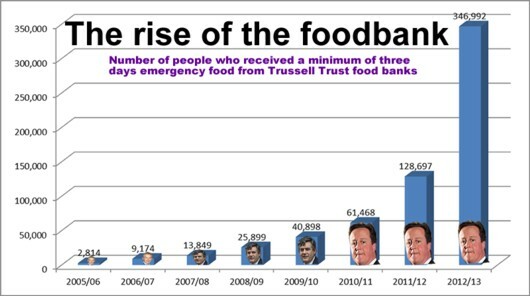 If the economy has been growing for the last nine months, why has food bank use almost tripled during the last year? No doubt Gideon George Osborne will spend the next few days (if not weeks and months) crowing about the figures from the Office for National Statistics that say the British economy has grown for a third successive quarter. The construction industry has grown by 2.5 per cent on the previous quarter, with house builders buoyed up by Gideon’s Help to Buy scheme, which offers (unsupported) mortgage guarantees to buyers and lenders. He has promised to divert £12 million to this, but has not said where he will find the money. Critics have warned that this is simply creating another housing-fuelled debt bubble that will burst in a couple of years’ time, leaving even more people in debt than after the financial crisis hit us all. Has this growth generated work for electricians, plumbers, plasterers, roofers? If so, are they being paid fairly? These are the people who will take their disposable income back into the wider economy, for the benefit of other businesses. Production (including manufacturing) and services are both on the up as well. The BBC report says nothing about retail. But if this good news is true, why is the Department for Work and Pensions determined to expand its Workfare scheme, as laid out in a Conservative conference announcement and by an article reblogged here. He is right, of course. Look at the rise and rise of food banks, which have seen a massive rise in attendances from even working people – whose wages simply don’t cover the cost of living. Benefits are, of course, being cut back by our “compassionate” Conservative-led government. They say there’s no money for it but – if the economy is surging back into growth – where are all the tax receipts from the big corporates that are profiting? Oh yes – they’re safely closeted in the tax havens that Mr Osborne kindly opened up for them. Ordinary, working, and poor people have to use their own limited funds to pay off a Conservative-run national deficit, presumably because Tories think the rich, who caused the problem, shouldn’t have to pay for services they don’t use. And the Institute of Directors’ chief economist, Graeme Leach, warned that there are “strong headwinds” restricting the possibility of further growth, including “debt and inflation” which are “rising faster than earnings”. That’s right. Only yesterday, Yr Obdt Srvt was talking with a gentleman who – despite having a full-time job – has fallen so severely into debt that he has had to cut his expenditure down to nothing but taxes, the vital utility bills (water but not heating), and rent. He has no budget for food and faces the possibility of having his belongings, such as his car, repossessed – and even eviction. Is he on the path to prosperity, Mr Osborne? Of course not. This report is merely further proof that you were lying when you said, “We’re all in it together” – as you did (again) at the Conservative conference. It’s prosperity for the greedy few, and austerity for the rest of us. Maybe you have a different opinion, but ask any average worker on the street and they will tell you that continued wage depression and price inflation, the expansion of the Workfare regime that gives free employment to firms that don’t need it while the workers themselves have to survive on benefits, massive growth in food bank use, and the threat faced by thousands of eviction and the repossession of their belongings are not milestones on the path to prosperity. 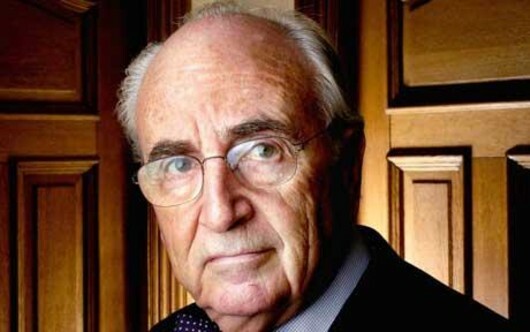 Unrepentant: Ignorant old Tories like Lord Young cannot see anything wrong with starving workers – and, through lack of tax revenue, the benefit budget – to make fat profits for greedy business bosses. The families of all those who have died because of these policies might have a different point of view. Apparently we are living in an excellent time for businesses to boost their profits – because labour is cheap. That is what Lord Young, who advises David Cameron on enterprise, told the cabinet yesterday (May 11). His words make it crystal clear that working people who vote Conservative are classic examples of turkeys voting for Christmas. They beg to be exploited. He said low wage levels in a recession made larger financial returns easier to achieve – in other words, he actually admitted that bosses could use the current state of the UK economy, as caused by his own government (not the previous Labour administration, for reasons we’ve covered in the past), to push workers’ wages down and keep more moolah for themselves. Vox Political has accused the Conservatives of exactly this behaviour in the past, but we never expected to see a member of the government admit it so brazenly. Let’s just back this up with some statistics, courtesy of The Guardian , shall we? 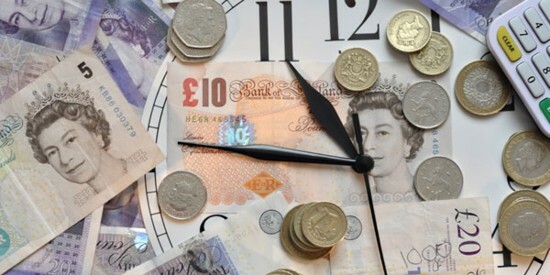 UK employees’ average hourly earnings have fallen by 8.5 per cent, in real terms, since 2009. That’s adjusting for inflation, and the newspaper got its figure from the Office for National Statistics. Meanwhile, the 1,000 richest people in the UK are now worth more than £414 billion – up more than £155 billion in the three years to December 2012. And in April, the Tory-led government gave those people a £100,000 per year tax cut. Lord Young is not to be confused with Sir George Young, the Tory Chief Whip who once famously said “the homeless are what you step over when you come out of the opera” – but he is cut from the same cloth. He had to apologise after telling the Daily Telegraph that “for the vast majority of people in the country today, they have never had it so good, ever since this recession – this so-called recession – started”. For this reason it is easy to suggest that he would have stepped over the body of Stephanie Bottrill, had he been the first to find it. Oh – do you think that statement goes too far? Please, reserve your judgement until I have explained my reasoning. Like so many members of the Tory government, this is a man who absolutely point-blank refuses to understand the relationship between the decisions he makes and the conditions in which the majority of us are forced to live. This former advisor to the Prime Minister on health and safety laws has advocated relaxing them, ignoring the fact that this will increase the likelihood of work-related injury that makes it impossible for people who need the money to go to work. This enterprise advisor was asked to conduct a “brutal” review of the relationship of government to small firms, presumably with a view to cutting off as much public assistance for small businesses as possible. This former chairman of the Manpower Services Commission advised the late Baroness Thatcher on unemployment, and we may take it that it is due to this advice that joblessness skyrocketed during the Thatcher years. He refuses to see that his attitude is causing the problem: By ensuring that Britain’s labour market remains “flexible” (read “low-wage”), he ensures that the national tax take remains far lower than it should be; low-paid workers form the overwhelming majority of the workforce. In turn, the low tax take means the government cannot pay off its debts and provides it with an excuse to cut public spending – especially on benefit payments. Stephanie Bottrill had an auto-immune system deficiency, Myasthenia gravis, which meant she was permanently weak and needed constant medication. Doctors said she was too ill to hold a job, but she never qualified for disability benefits. She committed suicide because she could not afford the cost of living after the Bedroom Tax was forced on her, and it has been said by others that she died for want of £20 per week. It is the attitude of Tories like Lord Young that has deprived her of that money – and ultimately, of her life. It’s no good pulling a face, George; we can all see exactly what you’re doing – and it’s neither big nor clever! There’s absolutely no possibility that George Osborne will give in to the latest calls for him to ditch his ‘deficit reduction strategy’ and adopt a more moderate plan. Firstly, people need to understand that the Coalition government’s fiscal strategy isn’t about reducing the national deficit at all. If it was, we would not have had a big tax break for the richest in society as part of the last budget. It’s a strategy to axe public services, selling off to rich corporations any that might be capable of yielding a profit. George W Bush followed this policy in the United States a few years ago; it’s called ‘starving the beast’ – look it up on Wikipedia. Secondly, a more moderate plan, mixing appropriate savings in government costs with growth-creating measures, is something Mr Osborne could never palate for one reason: It’s the policy put forward by the Labour Party before the 2010 election. Adopting it would mean that he was admitting Labour were right; the Conservatives were entirely wrong to put forward their ideologically-driven austerity plan as an alternative; and that he had wasted everybody’s time and tax money for the past two and a half years. At least we get the joy of watching all his support flow away, drip by drip. The current story shows nine of the 20 economists who signed a letter supporting austerity back in February 2010 (just before the general election) have had a change of heart. Others have already done so. Furthermore, Boris Johnson merrily stabbed the part-time Chancellor in the back, at the same time as the economists. He called for David Cameron to “stop pussyfooting around” and invest in major infrastructure projects in London. His outburst was an outstanding achievement as he managed to shoot himself in both feet at the same time – putting himself at odds with the Conservative leadership and showing the country as a whole how out of touch he really is. London has just received £9.3 billion worth of investment for the Olympic games, along with related infrastructure investments worth a further (reputed) £16 billion. Other parts of the UK are desperate for investment on a fraction of that scale! For example, the people of Scotland might reconsider whether secession from the United Kingdom was a good idea, if the UK government invested a little cash in their country; as might the people of Wales. Oh! But then, Scotland and Wales don’t vote Conservative, do they? USA – another great depression or greatly depressing? ≈ Comments Off on USA – another great depression or greatly depressing? Will the American public realise what Mitt Romney’s fiscal plans mean, or will they elect him anyway? Now that the Olympics are over and everybody’s having a rest from medal-counting (don’t forget the Paralympics will be starting soon, though, providing the opportunity to do it all over again), may I just take this opportunity to ask readers in the USA, just what the blazes is going on with your Presidential candidates? A few years ago, your economy was devastated by comedy president George W Bush, with a policy known as ‘starving the beast’. For those with short memories, this involved tax breaks for the very rich, creating a deficit in the US Treasury, which made it possible for him to claim public services were costing too much – and then cut public services. Bush left the White House in 2009 to pursue his career in stand-up comedy (and sank without a trace) but his ideas were taken up on my side of the Atlantic by one David Cameron and his bestie, George Osborne. They realised that, after the credit crunch of 2008, there wasn’t enough money coming into the British Treasury to pay for public services and launched their policy of fiscal austerity on the UK’s already-depressed economy. The tax breaks for the very rich arrived a few years later. Now, back in the States, you have a new Republican Presidential candidate, Mitt Romney, who – and please, correct me if I’m wrong – wants to starve the beast all over again. Mr Romney wants to impose tax cuts for the very rich, but has no plan to offset the effect of these cuts by closing other tax loopholes or the like. He claims there will be fabulous growth effects. Seeing as Mr Romney’s policy seems so similar to Mr Osborne’s, lets look at what’s happened here in Blighty since fiscal austerity started biting, shall we? From the moment Osborne’s first spending review (a mini-budget in late 2010) took effect, the economy flatlined. Since the beginning of 2012 it went back into recession in a big way, knocking a whole one per cent off GDP. Meanwhile, the Coalition (Conservative and Liberal Democrat parties) has cut taxes for the very rich but also raised the amount people can earn without being taxed. This inevitably means less revenue for the Treasury. Services are already being cut and they’re discussing ways to cut further than previously planned. Does anybody really think those poor people who’ve been lifted out of tax are going to be better off for the loss of the public services they need? Do any US citizens reading this seriously think that lower and middle-class people in your country are going to benefit from the loss of public services that will be required to make your ultra-rich even richer? And what’s the incumbent, President Obama, going to do? Are his budget plans any better? Many of you may be aware that I live in a large county called Powys, that has a small population. This means that the amount of money the local authority receives from central government and local taxation is always stretched very thin, in order to provide the services required across – what is it? – 6,000 square miles. Given that context, it should come as no surprise at all that some of the information I have been receiving about the way that money is being spent has raised concern. It seems the county council has employed a consultancy to carry out a survey of housing stock – to pinpoint where repairs are required and carry them out. This consultancy has taken £1.5 million from the council’s budget and not one repair has yet been carried out. In addition, it seems most of the council’s own employees at its benefits section have quit, to be replaced by staff from an agency. This organisation charges £20 per hour for each worker’s services, I’m told. Is this value for money? I don’t think so. I think it is a local symptom of a national malaise: the disastrous affair public authorities have been having with the private sector. It is an affair that has already led to the humiliation of the government in the G4S Olympic security debacle; an affair that has its roots in the Private Finance Initiative that was launched by the Conservatives in the 1990s and continued into the current century (to my shame) by my own political party, Labour. I have recently become quite a fan of ‘lefty’ columnist Owen Jones. This may come as a surprise to some readers as not only has he enjoyed greater success than me at the same career (journalism), but he is 16 years my junior. Talented, young and successful – I should be green with envy rather than cheering him on, right? In fact I’m simply glad that someone is around to say what I would have said, in his position. You may have heard this gentleman speaking on the BBC’s Any Questions (Radio 4, last Friday and Saturday), on the very subject of private involvement in public services. If you did not, allow me to enlighten you. “What’s happened with G4S has exposed the dogma of the last 30 years, that the private sector is good and efficient, and the public sector is wasteful. What happened when G4S failed? The state had to go in and fill the vacuum – and it’s not just there we’ve seen it. We’ve seen it with A4E, this welfare to work programe, this company that basically took taxpayers’ money to line the pockets of those who were running it; we saw it with PFI – started by the Tory government, continued under New Labour, that’s like paying for public services on a credit card, getting these private companies to do what the state should have done, apparently it costs up to £25 billion more, of our money. It’s the same with the London Underground; it’s the same with rail privatisation – we’re now paying up to four times more on subsidies for private rail companies than we did in the time of British Rail. And we’ve seen it recently with water. We just recently had a drought when rain was absolutely hammering the southeast. That’s because a water company sold off 25 reservoirs in the last 20 years. In support of that, let’s have a few facts and figures. Those I have at hand come from a book entitled ‘You Are Here’ by satirical luminaries Rory Bremner, John Bird and John Fortune, with Geoff Atkinson. It was published in 2005 so the information – accurate at the time – may be out of date by now and I would be happy to read any updates on what follows. When the railways were privatised (by the Conservatives) it was decided that one company would own and run the tracks, one group of companies would operate the trains and another group of companies would own them. There are three rolling stock leasing companies – roscos – that lease their trains to the operating companies. These trains cost just over £2 million to build and are leased out for £500,000 per year. Their lifetime is anything up to 40 years – which is a huge profit margin. But don’t worry – they don’t receive a penny of taxpayers’ money. No – the subsidy for the South Central franchise was set to increase by £342 million between 2005-2010. Of this, 80 per cent went to the roscos for new rolling stock – around £273,600,000. But it wasn’t taxpayers’ money by then. It was taxpayers’ money when it was part of the operating company’s subsidy, but when it was passed between that company and the rosco it was a simple business transaction. That’s how they get away with it. You and I both know that the cash came out of our pockets, but because it went through a middle-man, these companies can call it their own. You might be interested to know that the three leasing companies are (or were, in 2005) all owned by banks. According to ‘You Are Here’, “The Future of Transport White Paper says: ‘The privatisation of the rail industry in the early 1990s assumed that private sector discipline and innovation would drive down the railway’s subsidy requirement and drive up the quality of service. In part this has been borne out. Private Finance Initiatives were intended to bring private sector cash in to fund public services – which may seem like a good idea on the face of it. As ‘You Are Here’ states: The deal is simple. Money for the new service is raised privately in the money markets and thus kept off the country’s balance sheet… but like any free offer, it does come with small print. “The long-term value of PFI contracts may go down as well as up. Your public services are at risk if you do not keep up the repayments. The return for consortiums running PFI projects” – on the other hand – “may go up and up and up. Standard terms include: cost-cutting, short-term employment contracts, high management costs, huge legal costs. Every element must be a profit centre. After expiry of contract (typically 35 years) the consortium is under no obligation to renew the terms of the lease and can renegotiate at more favourable rates or move out of the public service sector and turn the property into a hotel or office block. To enhance profitability rather than deliver a service. In February last year (2011), David Cameron promised to deliver a ‘revolution’ in public services, in which he envisaged everything but the security services and the judiciary being privatised. You can read about it here. Private prisons; private police; private health services – we’ve seen these rear their ugly heads already, and I’m sure more is to come. Considering the disastrous profit-driven performance of the private sector in public services, as detailed above, I cannot think of anything worse than letting private companies continue with what they’ve got, let alone adding anything new to their portfolio of travesties! With this in mind, I have to ask why Powys County Council thinks employing a private firm to survey its housing stock, or workers for a private agency to administer its benefits, is an economical use of my taxpayer money. It’s time the madness stopped, and if Westminster is too sick to do it, then perhaps local government should lead the way back to sanity.